For the last 4 years I’ve participated in a wonderful fundraising event with the Stanislaus Family Justice Center. This organization helps children and families living in crisis situations by providing counseling and resources. To help the children heal, they have a program called “Art Restores Kids”, where they help them use art to express themselves. 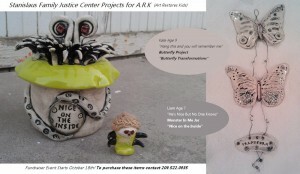 “Art of Justice Celebration & Fundraiser” event. My daughter Becca (also an artist), and I went to the January Artist Choosing Night where we selected our inspiration pieces! This year I chose 2 pieces! Before I share the before and afters I wanted to preface it with some “behind the scenes” insight in my studio that affected the outcome! Time, Weather & Challenges! These factors made creating new pieces difficult and I must say, and still feel, that everything turned out as it should have. At the end of this blog I’ll share “what should have been”! The purpose of this workshop is to help children understand that even dark moments can turn into something more beautiful. Contrasts! Dark and bright, shadows and light…without one there is no other! Sometimes the most challenging, shadowy, moments in our lives are springboards to fully appreciating, the bright and brilliant moments that’s come our way. 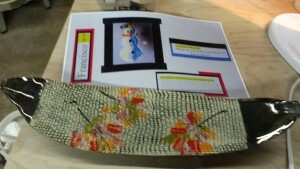 I selected Francisco’s artwork without hesitation! My mind kept flashing back to a piece I had already created a few months prior, but thought I needed to design a new one specific for this event. 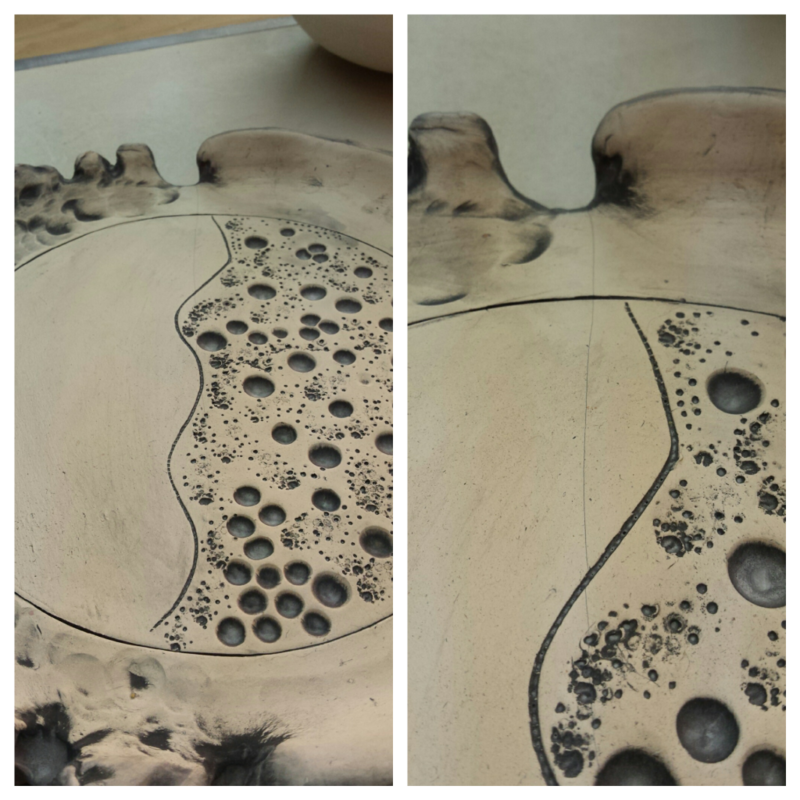 As I began making the new piece I experienced one disaster after another, then to finally discover it cracked in the kiln. Being that it was too late to start again, I joyfully brought the original piece I had in mind from the beginning! 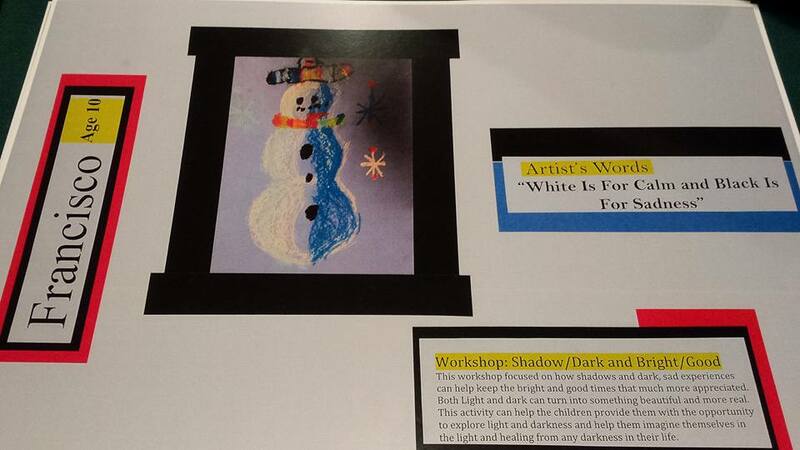 The young artists happy white and dark snowman along with the brilliant colors added in his hat and scarf, are exactly the contrasting elements that were used in my piece! 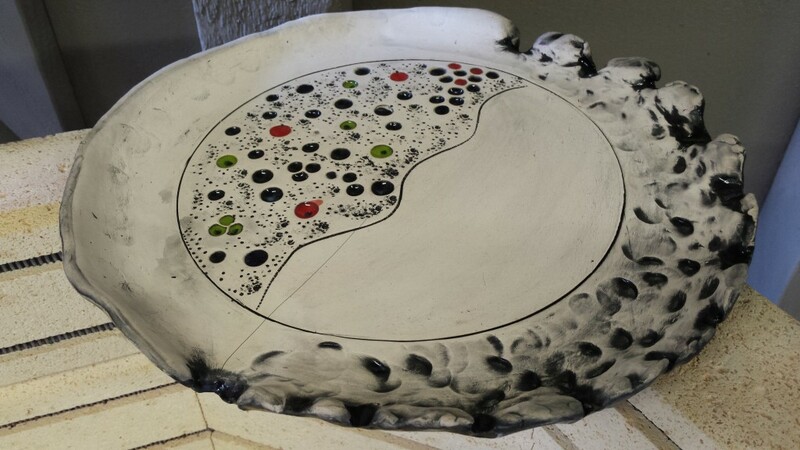 The black valleys and white raised areas signifying those times in life we move in and out of the “shadowy places”. Without these texturing moments to life (and in this piece),the colorful leaves and chrome surfaces would not shine as bright. It’s a happy piece combining dark, light and beautiful brightness! 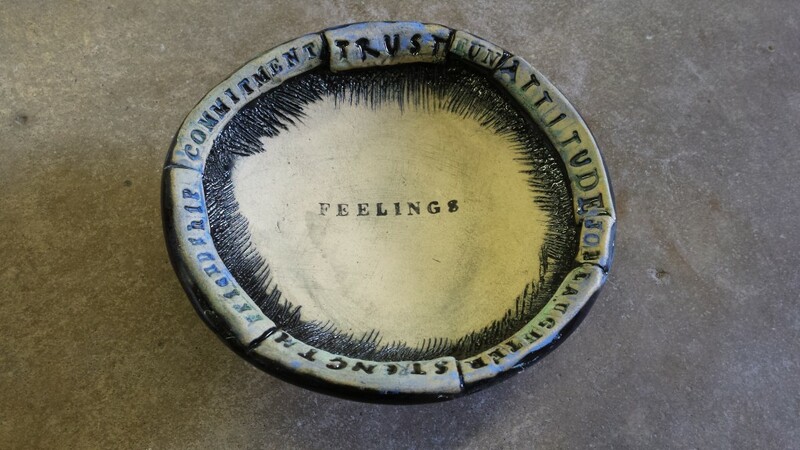 This workshop allows children to learn about feelings identify them and express them as art. “Our face” is not necessarily the expression on our physical face, but the outward projection of our inner self through certain actions. 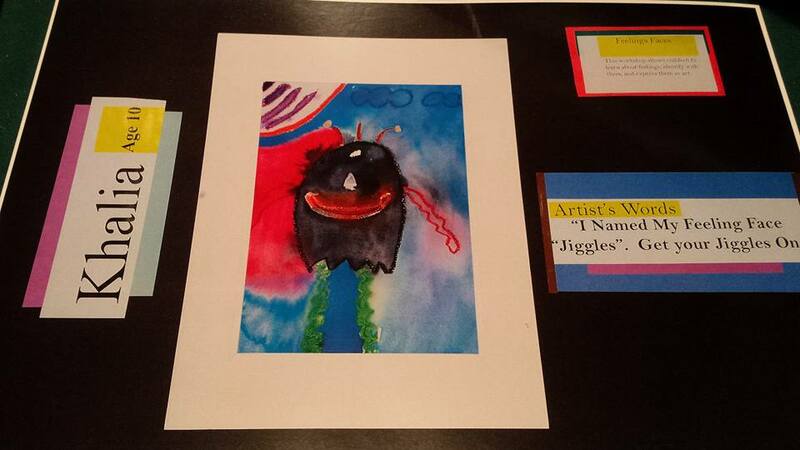 Khalia’s “Jiggles” monster is in motion, it’s moving. To me I felt it describes what you feel like when you are blissfully happy as you can see her little creature is experiencing. THE ONES THAT DIDN’T MAKE IT! Maybe it’s because I’ve been away from the studio too long and didn’t have my head straight, but the creation of pieces for this project didn’t go as planned. In fact, the pieces that were actual made specific to this project didn’t even make it to the show. Here’s what happened. Time: A full schedule (along with indecisiveness on the direction I wanted to take with each piece) had me starting 3 weeks before the deadline. It should have been enough time, but there was a little thing called…. Weather: Once I finally got started it was cold, rainy and in a studio with no insulation, it created some…. Challenges: I’m giggling as I think of it now, but the bisque fire had me right in a place where I would finish the morning of the deadline! 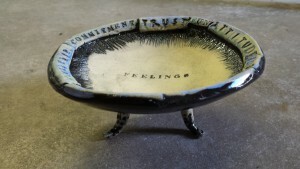 BUT… the earthenware piece received a hairline crack …so that made it dead in the water. Luckily I had a piece already in mind for a replacement! Since I wanted to see the end result I fired it to completion. The hairline crack grew and cracked all the way through. It turned out great (to me) but unusable! 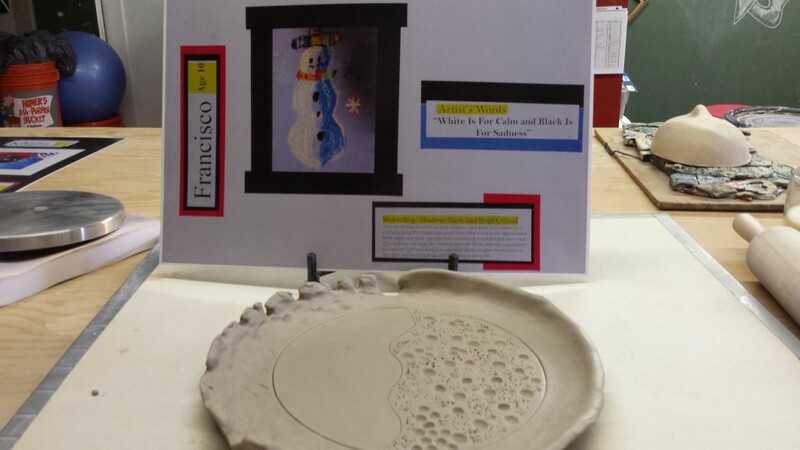 The second challenge happened when I realized I made the pieces of two different clay types . 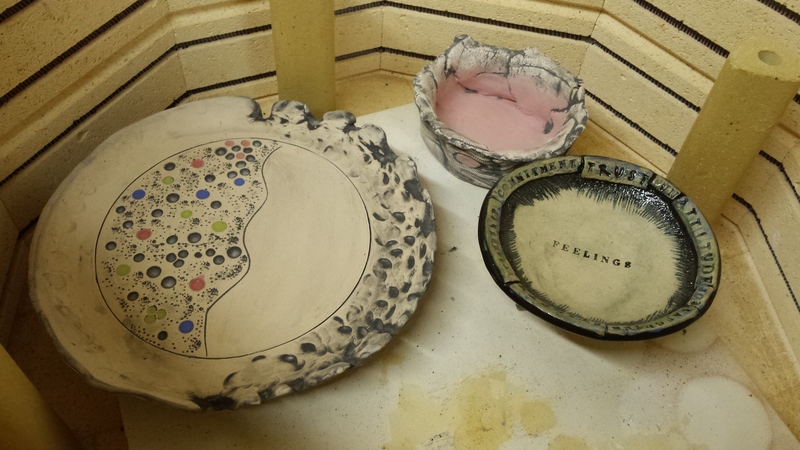 Earthenware (cone 04) and Stoneware (cone 6) could not be not be glaze fired at the same temperatures. 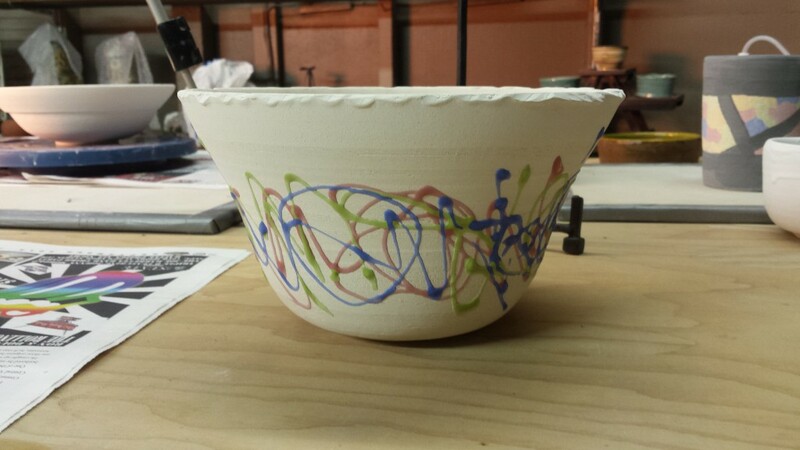 With only one day to go and time NOT on my side, I glazed the stoneware bowl with all the “jiggles” and “wiggles”…but was unable to fire it in time. With alternations made on two other pieces already completed, I was able to submit something for the show, but not without a little disappointment that the original concepts would not be represented. Lesson Learned: BE PREPARED & START EARLY…you just never know what can happen! What are you doing, writing a book? As usual, I love your work. 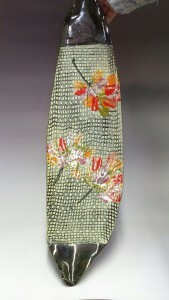 You have such richness to your designs. You do the unexpected…which is so like life. You are amazing…that’s why I like you so much. Thank you so much Tari! We are enjoying the clay journey aren’t we? :D Love it the most when a piece serves a purpose! Hi Tammy Jo, I really enjoy watching your YouTube channel as it’s light-hearted yet informative and I really like the fact that you enjoy experimenting. I feel as if I’m learning alongside you. As for the crack in your beautiful plate, have you ever tried kintsugi?